On Thursday 23rd September 2010 we are welcoming the HSK show van to our showroom and inviting people to come in for the chance to see a selection of their current range, a look around our showroom and a glass of wine. HSK are manufacturers of shower enclosures, shower trays, bath screens, shower panels, shower packs, brassware, mirror cabinets, bathroom radiators and accessories. In the coming weeks our blogs will be focusing on shower enclosures, starting this week with shower cabins. 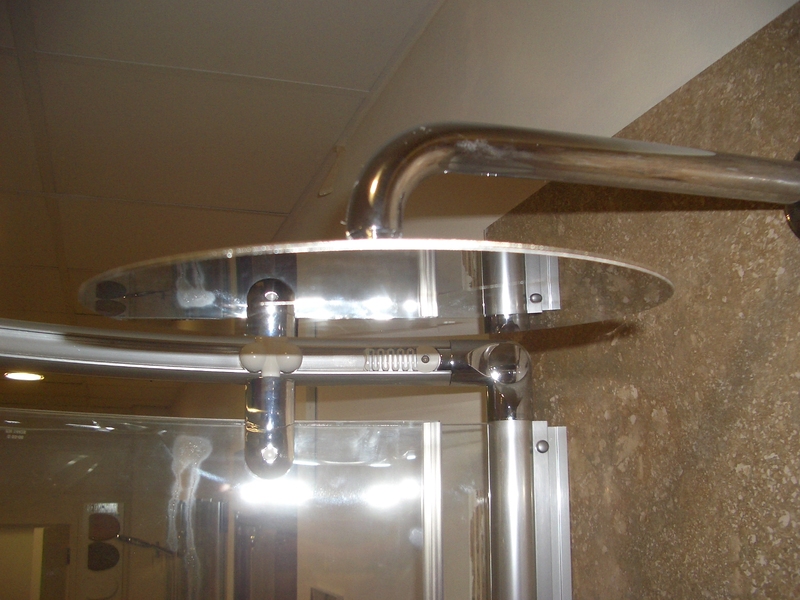 A shower cabin kit comprises shower tray, sides, door, shower pack including the showerhead and sometimes a roof dome or pod. The average price for a shower cabin ranges from £500 to £1500. Warehouse stores do sell them cheaper but the quality tends to be poor. At the other end of the scale a very high quality, large cabin with steam, multiple body jets, mirror, lights radio and hands free telephone connection can set you back up to £13,000! Perhaps for that sort of money you would want to consider letting your phone go to voicemail while you’re showering. Shower cabins offer fewer flexibility and design options, it truly is ‘what you see is what you get’. The sizes range from 710mm x 710mm up to about 1200mm x 900mm. The most popular shapes are square, rectangle and quadrant. In the main, shower cabins are made up of moulded plastic side panels with all the controls, jets, brassware, soap trays and seats built in. The price will determine whether the door (and clear side panels) will be made of glass or a composite material. As with all showerheads and brassware shower cabins require a minimum water pressure. For a multi-jet unit you will need high-pressure hot and cold water supplies. Shower cabins can go anywhere there is a water supply. The units come complete with a pre-connected waste hose fitting. They can be assembled very quickly, pipes connected and within a couple of hours you have an operational shower. Having said that, if you want the cabin to sit flush against the wall it is a recommended for the pipework to be recessed. Can go anywhere there is a water supply. Can be purchased ‘off the shelf’. 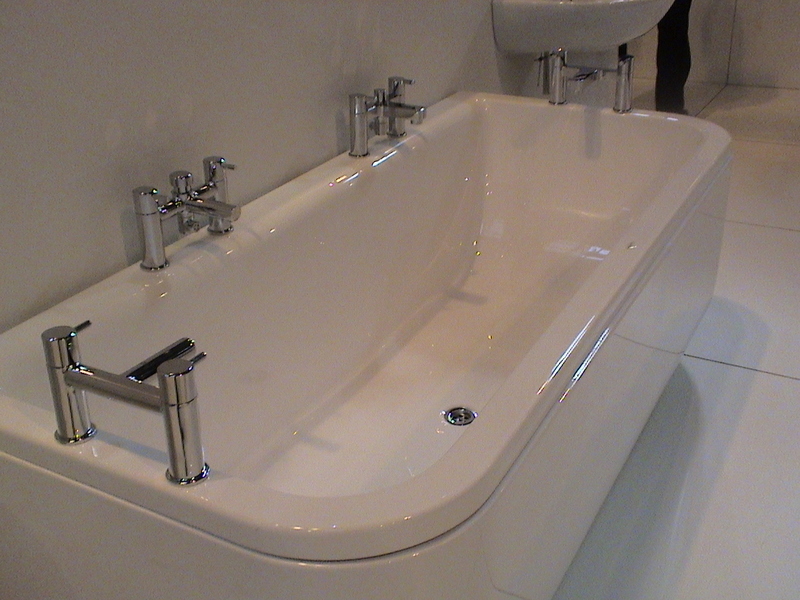 All brassware, thermostats and controls included. Can offer varying options such as steam, multiple body jets, seats, lighting and entertainment. Inexpensive to manufacture, so low cost. Can be lighter than a tiled and glass enclosure. Unlikely for the shower tray to crack with movement should the floor shift. Inflexible in terms of size, shape and design. Due to the amount of plastic generally used they can look cheap and nasty. 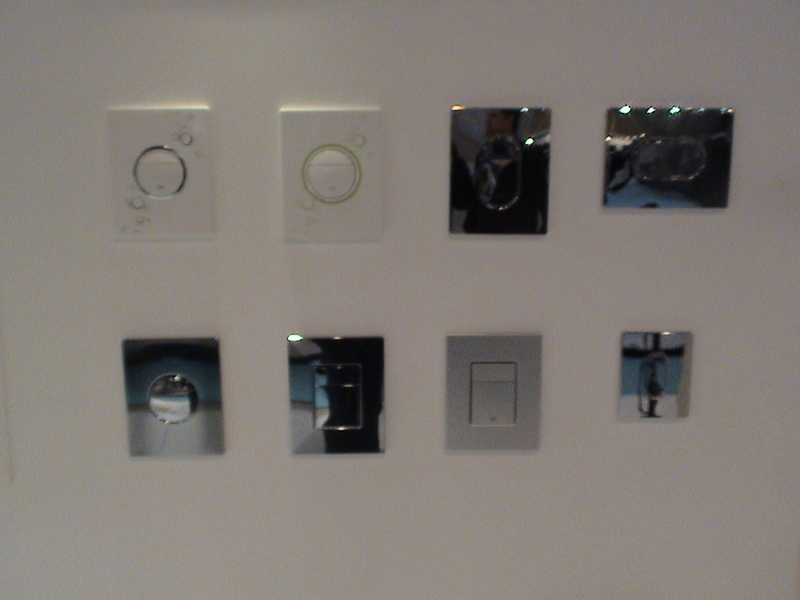 Lower price units will be equipped with lower end products for the showers, thermostats and controls. Quality, design and functional extras can increase the price dramatically. Cannot be recessed into the floor. Some cabins have a high shower tray to step into. 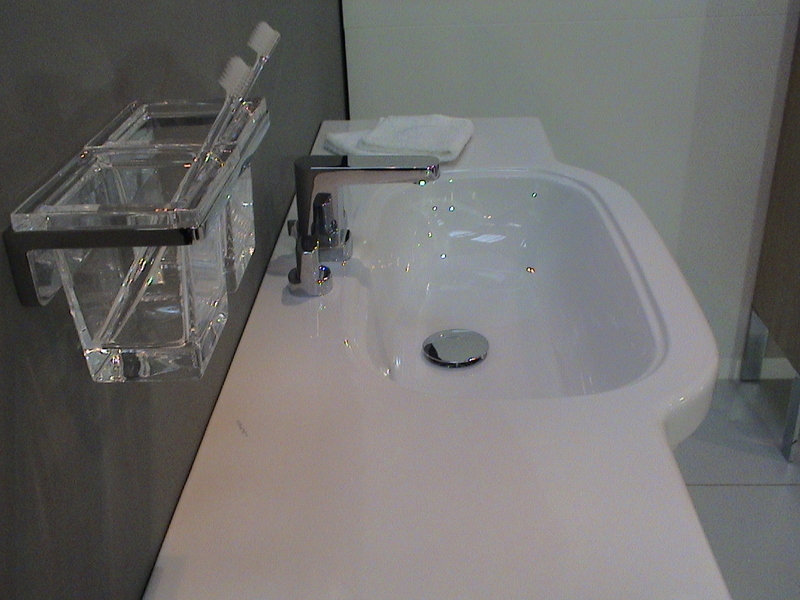 Manufacturers may make good trays and enclosures but taps and showers are not their speciality (or vice versa). Cannot mix and match products to optimise function. In next week’s blogs we will be looking at the alternative to shower cabins and the infinite design options you have when creating your own shower enclosure. Roll top, in particular, slipper baths. Lion’s paw or claw and ball feet. High-level cisterns with chain pulls. 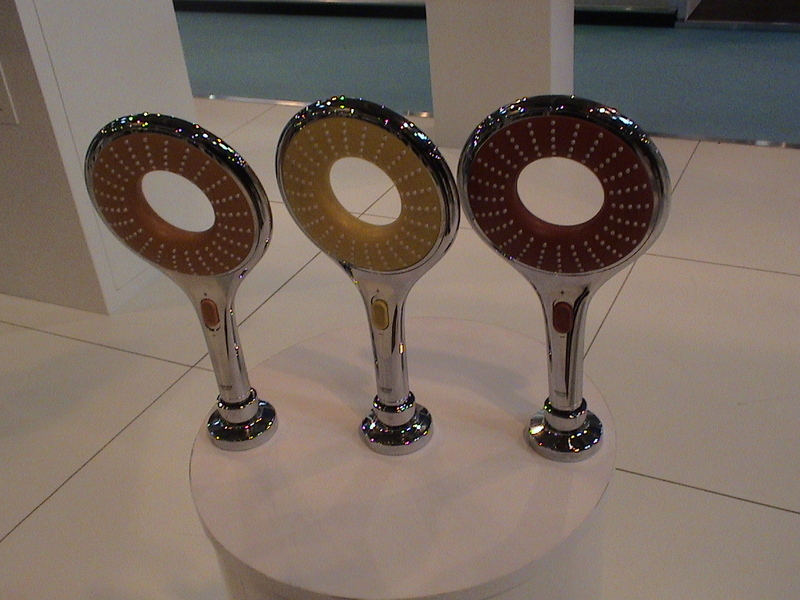 Cradle bath/shower mixers in gold or chrome. Is this reality or pastiche? What was a Victorian bathroom like? Well, for the majority there was no such thing as a bathroom. As people flocked to the cities living conditions were cramped and unsanitary. In London, houses were over-crowded, close together with narrow streets between them. Open sewers and drains, originally intended for rainwater, ran down the middle of the street carrying human waste, dead animals and rubbish to the Thames. The Public Health Act 1848, the death of over 10,000 Londoners between 1853 and 1854 from cholera and the “Great Stink of London” of 1858 forced the Government (who can blame them, they were sitting right next to its source) to commission a new sewerage system to take the waste away from the Thames and off the streets. By 1866 and with thanks to engineer Joseph Bazalgette, most of London was connected to a sewer network, which diverted the foul water to treatment works. However, many houses weren’t connected to the sewer system or piped water until the early 1900’s. For the working classes the “privy” was one or two toilets shared amongst the inhabitants of a whole street. These were often nothing more than a wooden bench with a hole in it over a brick built ash pit. Although flush toilets were invented in 1596, they did not become widely adopted because most houses didn’t have a supply of running water. As water supply and sewerage improved the grander of the Victorian homes featured elaborate embossed and decorated toilets made by Thomas Twyford, Josiah Wedgewood, Thomas Crapper and John Shanks. The earlier cisterns were at high-level supported on cast iron brackets with a china or wooden pull on a chain. Some were a copper or tin tank enclosed by an oak or mahogany box, some cast iron but usually, enamelled porcelain. By the late 1880’s improved siphonic flush pans allowed the cistern height to be reduced to just above the pan. The materials used for the cisterns were much the same, some of vitreous china but rarely as highly decorated as their predecessors. Toilet seats were oak or mahogany. Until the mid to late 19th Century, even for the upper and middle classes, the bath was made of copper or tin. It was a portable affair used in the kitchen of most homes, the bedrooms or dressing rooms of the wealthy. The poor collected water from a street pump which would heated on the fire. The bath was filled and emptied with pails adding more hot water as each member of the household took it in turns to bathe. The rich, had a pumped water supply and servants to carry the heated water from the kitchen. By the late 1880s, as indoor plumbing with water tanks and gas water heaters became more widely available, houses for the middle classes were built with bathrooms equipped with cast iron full-length baths. Victorian baths were usually regarded as furniture and tended to boxed in. Bathrooms were often wood panelled with hand painted, porcelain tiles. For the early, wealthy Victorians the wash stand was a piece of bedroom furniture, with heavy ornamentation and white marble tops. Until plumbing became commonplace in the late 1800s/early 1900s a porcelain bowl and jug were the basin and tap. With the introduction of piped water the washbasin was plumbed in, often set in a floor-standing wooden cabinet or a shallow box supported on legs. Without a water supply or heating appliances showers were a rarity in Victorian times. In the latter half of the 19th Century some wealthier people had shower fittings, mounted on a frame over the bath with a manual pump delivering the water. In reality, bathrooms were not commonplace in the Victorian Era. The conversion of older houses to include bathrooms did not take place until the late 1800s. It was not until the 1900s that all but the smallest houses were built with an upstairs bathroom and toilet. Bathrooms in working-class homes were not commonplace until the 1920s. Many of today’s Victorian houses have been converted or extended to include a bathroom. A modern day version of a Victorian bathroom is unlikely to match the reality of how it was. 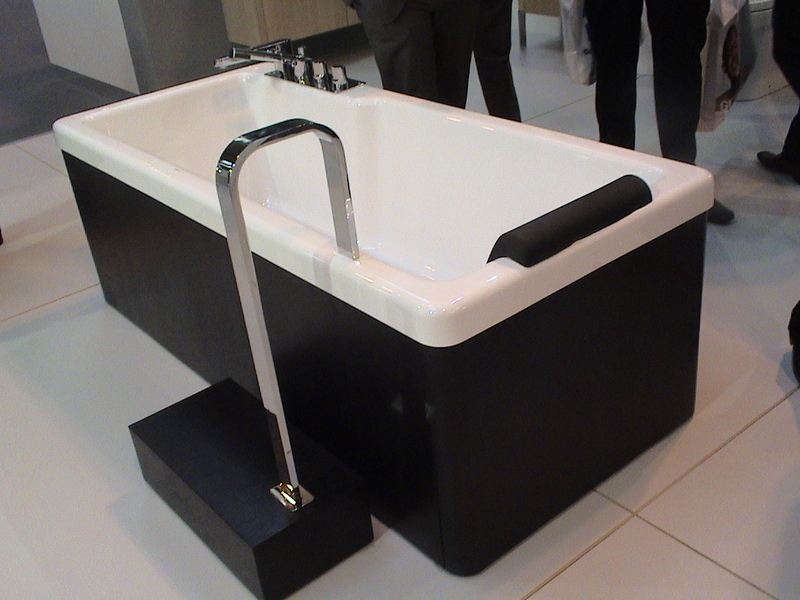 Freestanding baths were a necessity and in the majority of cases portable. They had flat bottoms to sit on the floor and unlikely to have ornate, heavy lion’s paw or ball feet. It was not until later, when plumbing was commonplace that the freestanding bath was lifted off the floor with feet to allow for a waste. The Victorians encased their baths and basins in wood to make them items of furniture. There were no mixer taps and showers were uncommon and certainly a separate shower enclosure did not exist. A Victorian bathroom was a luxury enjoyed by only the wealthiest and would not be considered to be energy or water efficient! This is the first in our ‘Bathrooms through the ages’ series and we will be going back in time to visit other eras over the coming weeks. 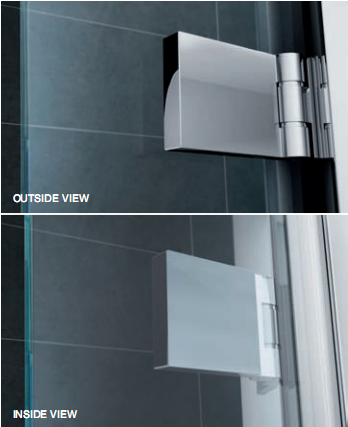 Next week we travel bang up-to-date with a look at shower enclosures. This will coincide with our event in conjunction with HSK who will be demonstrating some of their products from their show van. For more details and to RSVP to this event see our Facebook page. Our last three blogs tell you everything you need to know before you start designing your bathroom including some of the common problems. This week we prepare you for the delivery and installation. Once you have read this you are ready to choose your products. Logistics – Many people look at their bathroom in isolation. The new bathroom could be palatial in size, it may take up the whole floor of a house but you still need to get the items from the delivery truck to the bathroom. Always consider the route these items need to take. The last thing you want is for the delivery men to leave a bath or sink in your front garden because it won’t go through the front door. Or to break a 1600mm single part shower screen trying to get it up an awkward staircase. Know the journey everything needs to take do not leave it to guess work or worse still, wishful thinking. 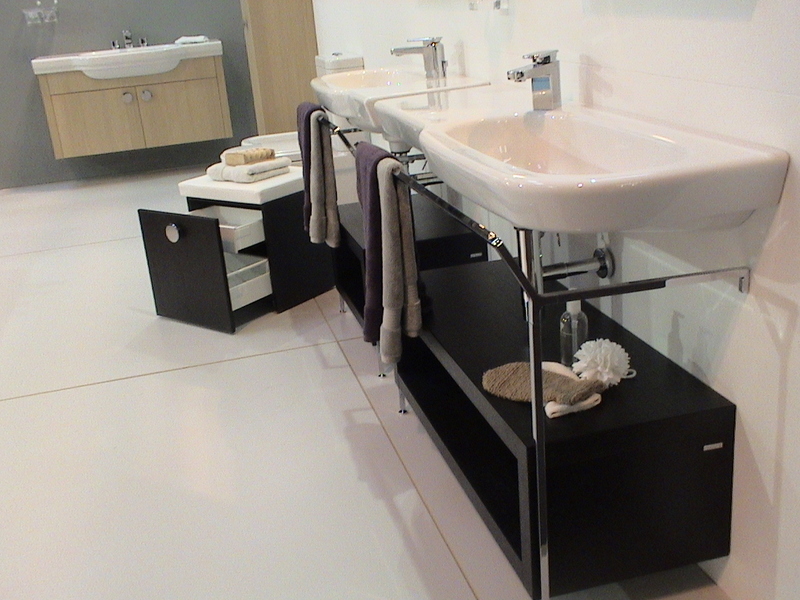 Storage – In general, a bathroom supplier will deliver the whole order in one delivery. Make sure you have somewhere safe to store the goods until your installer is ready for them. If you don’t have the space, ensure you tell the supplier in advance. They will know the order in which to receive and deliver the items as and when your installer needs them. Stress – Having the workmen in at any time can be stressful. Having a new bathroom fitted no different. In an ideal world, go away for a couple of weeks. Have the work done when you are on holiday or just move out. If this isn’t possible take all precautions to preserve your sanity and your home. Ensure there are adequate floor and carpet coverings. Put down heavy dust sheets and if necessary, cover those with some plywood boards in areas of heavy traffic. Cover all furniture, electronics and valuable items with plastic sheeting and seal doors to other rooms with plastic sheeting and heavy-duty tape. If you have more than one bathroom DO NOT have them both renovated at the same time, leave at least a few days in between. If you have only one bathroom make sure the installer re-connects the toilet pan every night. Installation – We cannot harp on enough about having a good installation team. Apart from being trustworthy and reliable you really do need workmen who are experienced in bathroom installation. If you are buying complex brassware such as body jets, thermostatic valves or bath fillers – make sure your installers are experienced with these types of products. Amateurs may not understand the mechanisms and try to assemble parts they are unfamiliar with. Many of these components come in three or four boxes and on occasions we have seen that these boxes have all been emptied out in one place, parts that were considered to be irrelevant thrown away, the instructions lost and the installer completely confused. Bad workmanship can lead to a disappointing finish with products being damaged, wood furniture and chrome getting scratched, taps scored and screws ruined because the wrong screwdriver was used. Don’t leave it to chance, use installers who are insured and can provide references…don’t be afraid to check them. 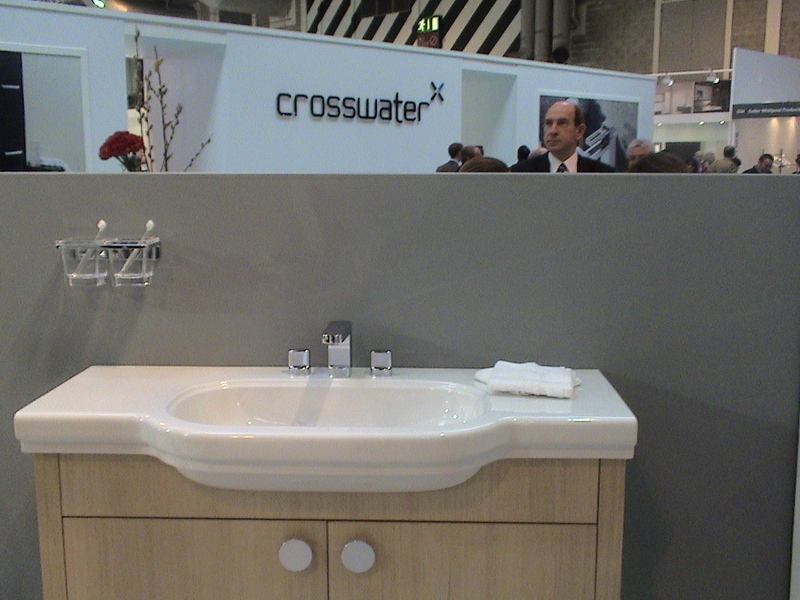 In our next blog we will be delving into history and looking at bathrooms through the ages, their function and design. 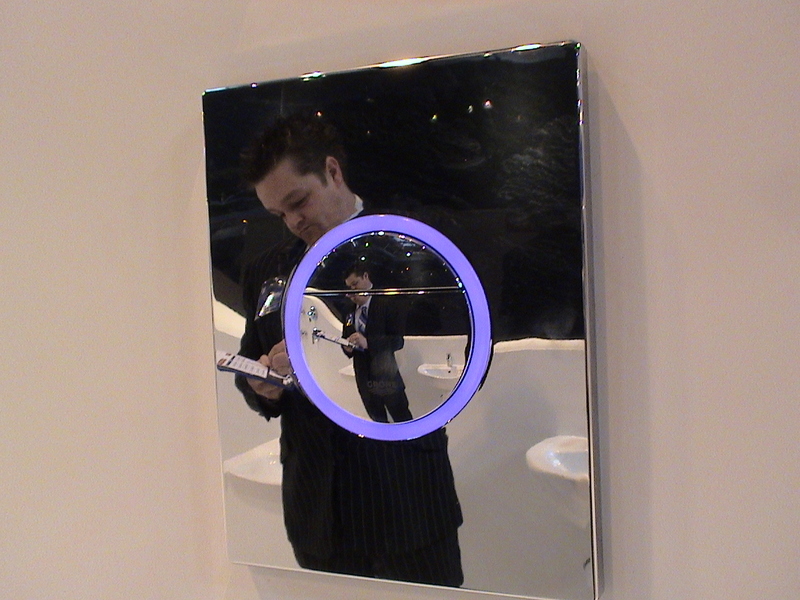 If there are any bathroom subjects you would like to know more about or have any comments please feel free to do so. Pressure – One of the most common pitfalls in bathroom design occurs with the wrong taps and showers being installed on incompatible water systems. There is a vast difference in available ranges between low (<1 bar) and high pressure (>=1 bar). Ensure you buy the correct brassware (taps and Shower) for the pressure in your home. London for example is now becomming a high pressure area so be careful not to buy taps because they are an attractive price, there may be a reason for it! Pumps can be installed to increase pressure EXCEPT if you have a combination (‘combi’) boiler, which is a pumped system. As a rule you cannot install additional pumps as it will result in them fighting each other, resulting in no pressure just a problem! If you are replacing your boiler make sure you are getting the right system to give you the best pressure to every appliance throughout the property. A combi will pump water to a degree but you may be a long way from your boiler and have more bathrooms, this could result in the highest shower in the house being unable to work at sufficient pressure. So if possible look at the whole system even before buying a new boiler, it could be that a gravity system is the best solution with header tank and not a combi boiler. When it comes to pumps there is a lot to learn. Noise – No-one wants to be woken up in the middle of the night by the flush of a toilet cistern. Even the quietest cisterns make a noise so try not to mount a WC against a wall adjoining a bedroom if you have a choice. Take into consideration noise from pumps and running water when deciding on your wall and floor coverings. Pipes – Avoid moving the soil pipe externally as you will need to drill a very large hole through the masonry and will be left with an equally large hole to fill where the pipe used to be. If you have concrete floors it is likely to be an expensive and messy job to move the pipework. Consider running pipes along the walls at low level. These can be concealed with timber boxing or behind storage units. Shower enclosures – Installing a walk-in shower on a concrete floor will also need the floor to be chased out to conceal the waste water pipes and shower trap, so that the tray is at the same level as the floor. Even though you can buy very shallow shower traps it will still be a costly and expensive job. An alternative is to raise the shower tray on up-stands or to build a framed & boarded platform; tile the platform and you could even add a couple of small LED lights to enhance its look. Wall fixtures and weight – Before you set your heart on wall hung bathroom fittings make sure you know that the wall construction is able to accept the fittings and carry the weight. Similarly, if you envisage yourself languishing in a cast iron, roll-top bath with floor-to-ceiling travertine marble and heavy stone flooring, check that the construction of the property can withstand the weight. Ask the advice of a builder or structural engineer and if there is any doubt choose lighter alternatives. Renting – One of the biggest mistakes made by landlords is to use cheap and cheerful products that cost them dearly in the long run. You don’t have to buy expensive items, but make sure you buy robust products which can withstand a hard time; tennants are not always the best at caring for a bathroom which is not their problem. We prefer British or European manufacturers with long guarantees, for which spare parts are usually readily available. Functionality – Your bathroom not only has to look great, but it has to work the way you need it too as well. 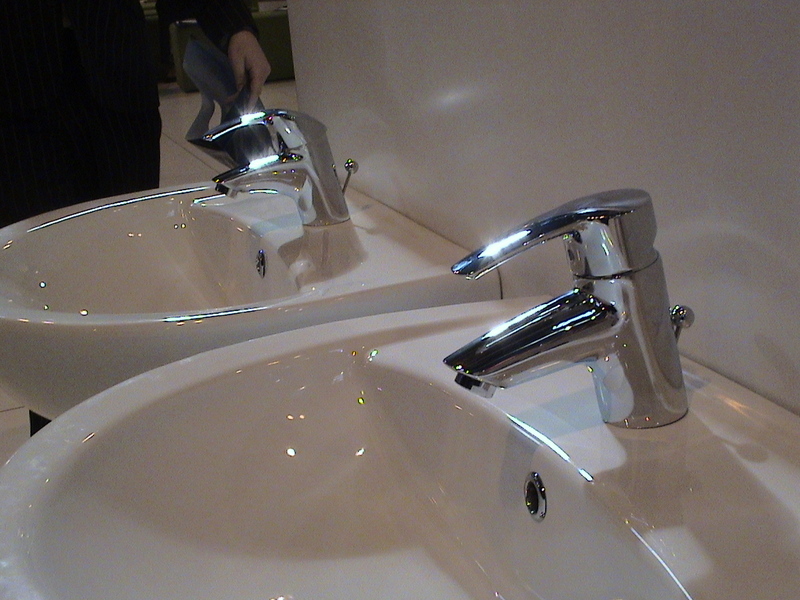 Those lovely, sleek, minimalist taps looked great in the showroom but are no good if you’re not able to grip them with wet hands or if you have arthritis. The big rainshower, which in the advert showed someone basking in a stream of jetting water, may manage but a dribble in your top floor bathroom which will be a massive dissapointment. The bath you want may well be large enough for a family of four, but takes half an hour to fill and if your living alone ask yourself is this practical for the size of the house. Also consider the water cost of filling that bath. Having a separate bath and shower in a small London bathroom will not work if you have to squeeze through the door which just about opens. Remember a shower can easily be incorperated into a bath. 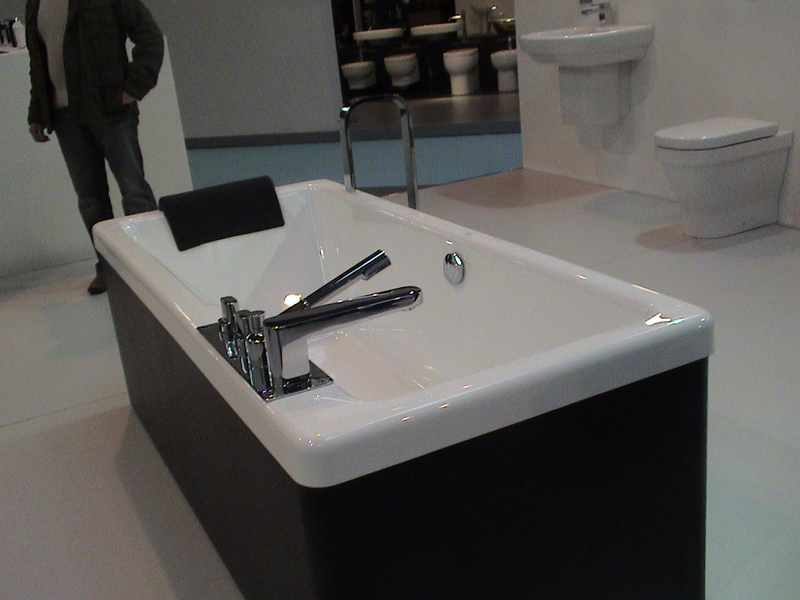 Do not become disillusioned with your new bathroom; keep it simple, keep it practical and the design will follow. Also, simple designs mean less costly installation. We have lots to say about installtion issues into the future, so stay tuned. 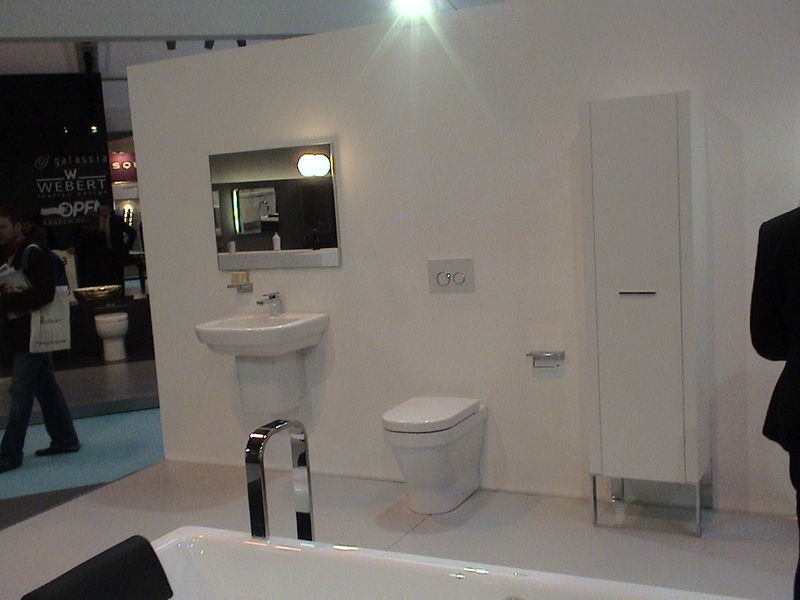 In our next blog we will give you some top tips on preparing for the delivery and installation of your new bathroom. Top tips to prevent “information overload” when designing your bathroom. Following on from our last blog “Top five things you need to know before you start designing a bathroom” this article deals with aesthetic considerations. Having a clear idea of how you want your bathroom to look will help separate the wheat from the chaff; and will save considerable time. 1. Know your style – have a good idea of the look you require for your bathroom. Do you like a traditional or modern style? If traditional, of which era? Victorian, Georgian, Art Deco or even Retro? Take into account the application when deciding on the style, many bathroom styles are timeless but some will be fashionable for only a couple of years. Think about what you like and answer as many questions as you can before you start. Do you like round or square? Do you want a bath, walk-in shower, wet room or combination of all? Do you want built in storage or cupboards? Storage is very important. Look at magazines and brochures to build up a picture of the things you like. Create a scrapbook of everything that catches your eye. 2. Know your colours – we’re not talking about avocado suites here, although if you are going for a retro look, there are still some manufacturers that supply the old seventies colours. Add to your scrapbook colour swatches, pictures of tiles and stones that you like. 3. Know your lighting and electrical requirements – think about the lighting at the same time as deciding on colour schemes. Remember you don’t have to have just one light in the centre of the room or a number of downlighters. You can consider having separate circuits with different types of lighting to set the mood in your bathroom, remember though; our advice is to keep it simple. This can include floor lights, LED lights in the shower, mirror strips and so on. Don’t overlook the need for shaver points or somewhere to plug your electric toothbrush. Remember to think about an extractor fan. 4. Know your limits for cleaning and maintenance – keep in mind the more ornate the fittings the more cleaning and maintenance they will need. Pedestals need to be cleaned and you need to get behind them. 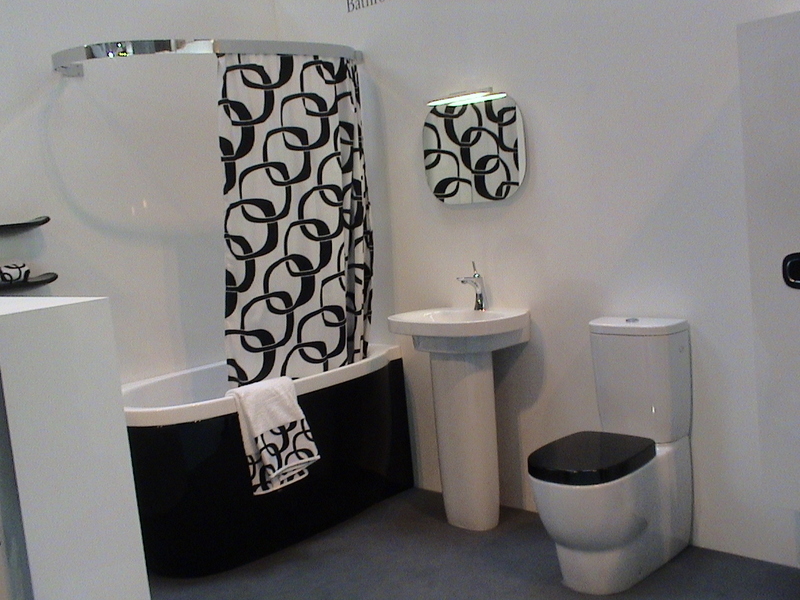 If you want low maintenance you may want to consider wall-mounted sanitary ware and very plain, sleek fittings. 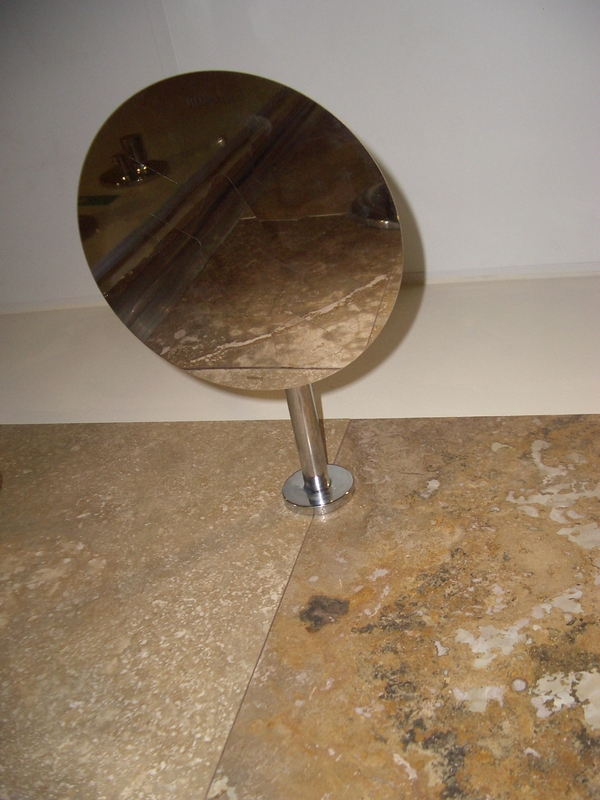 Products such as natural stone, although long lasting, will need periodic sealing. 5. Know your budget and timing – Fonte Dei Marmi offers a complete design, supply and installation service although you may want to manage it yourself or use your own contractors. Either way, your budget should take into account the installation costs will be more or less equal to the cost of the products you buy. Knowing your budget will help to get the design exactly right to suit every aspect. In an ideal world you should start planning three to six months ahead to ensure that you are up-to-date with all the latest products but also that you are not putting yourself, your contractors or suppliers under any unnecessary pressure. Take into account it can take up to six weeks to take delivery of a good quality bathroom suite and often, many European manufacturers are closed for extended times during the summer months. Planning ahead like this will avoid disappointment or possibly having to settle for something that is available rather than what you really want. 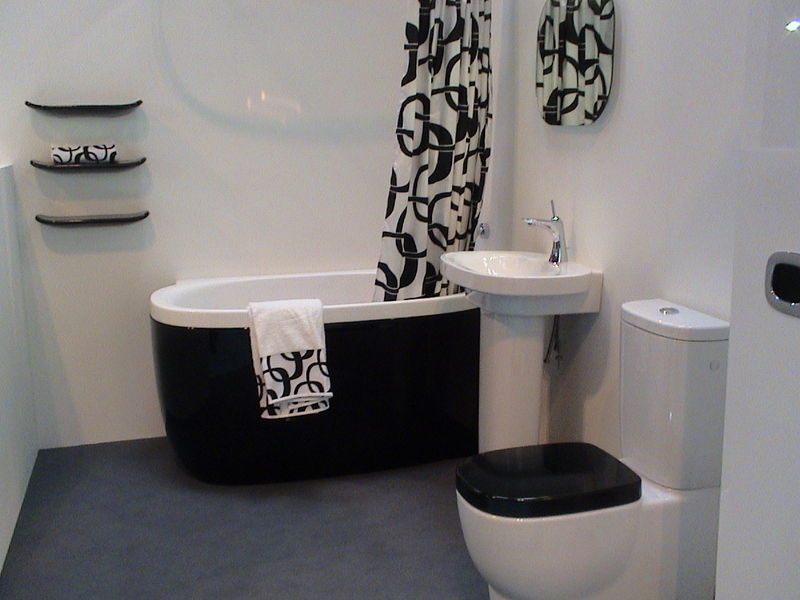 In our next blog we’ll take you through some bathroom design pitfalls and how to avoid them. Starting our series of bathroom design, installation and maintenance blogs we’re kicking off with the basics; the things you need to know before you even start designing. With this information, either on paper or in your head, you can confidently start the design process and get practical, relevant advice and assistance. Without this information you can walk into a bathroom showroom and lose a day and quite possibly, your mind! With it, you can be in and out in an hour with a very good idea of what you can have, how it will look and when you can be enjoying the bathroom you want. 1. Know the shape and size of the bathroom – know what it is you’ve got to work with. Is it an existing bathroom, an entirely new room as part of an extension or a room converted from a different use? If the room is an odd shape you need to consider whether or not you will be squaring it off. Will you be constructing any new walls or partitions? Know the measurements of the bathroom, as it will be after any changes. Measurements are key. Be sure to take into account window positions and include their height. 2. Know your boiler type, water pressure and flow rate – these are things often overlooked when starting the design of a new bathroom. It’s a good idea to get a plumber to test your water pressure (measured in ‘bar’) and your flow rate. Knowing your water pressure will give an indication to the type of brassware (taps and showers) you can have. Knowing which type of boiler you have will also determine whether the water pressure can be enhanced using a pump should your needs require. 3. Know the location of existing pipes – this sounds obvious although often forgotten. In many cases, depending on the floor, pipes can be moved so you will have a lot of flexibility with design of the room. The position of the soil pipe will determine the position of the toilet unless you use are going to install a macerator or extend the soil pipe internally, which may require boxing in. 4. Know the application – who is going to use the bathroom and how will it be used? Will it be a family, guest, en-suite or kids bathroom? Is it a wet room you’re after? Will elderly people use it? Consider if the user is advancing in age, they may be fine to jump into a bath now or turn sleek smooth taps but what about in 5 or 10 years time? Is the property one in which you will be living for a number of years? Will it be rented out? Or short term, perhaps doing it up to sell. 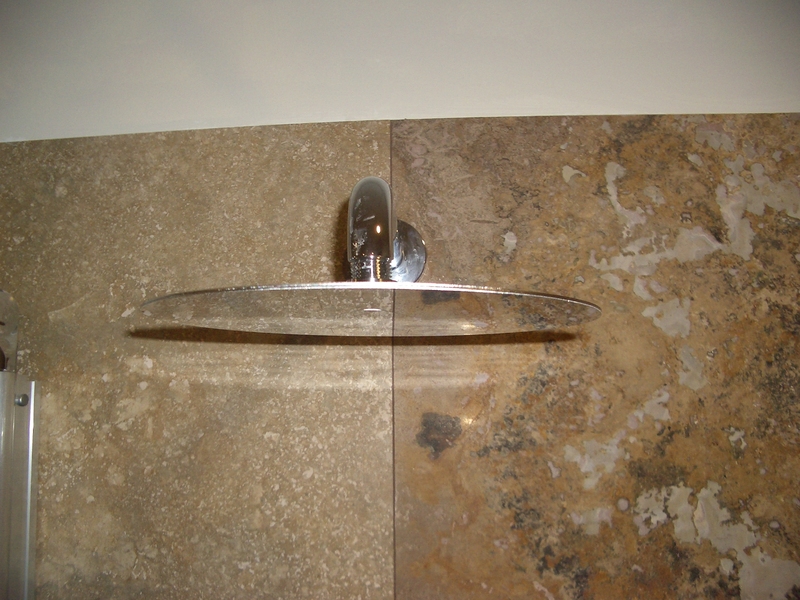 Being clear on this will give a clear indication of the types and styles of the products you need in your new bathroom. 5. Know the existing floor construction – If you don’t already know the type of floor you have then this is a good time to investigate, you may have to lift a couple of tiles, some carpet or whichever flooring you have now. A pain? Yes! But it will save you a lot of time, effort and perhaps cash, if you know what you’re working with. 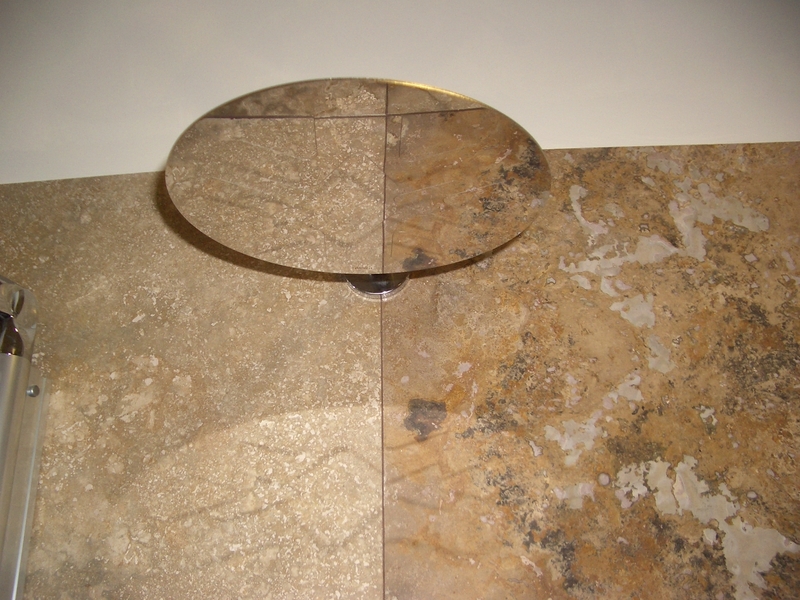 You will know if there are any limitations; such as moving pipe work, shower trays or floor coverings. Your most important consideration at this point is whether your floor is joisted or solid (for example, concrete). In our next blog we will be continuing with aesthetics, maintenance and safety considerations. 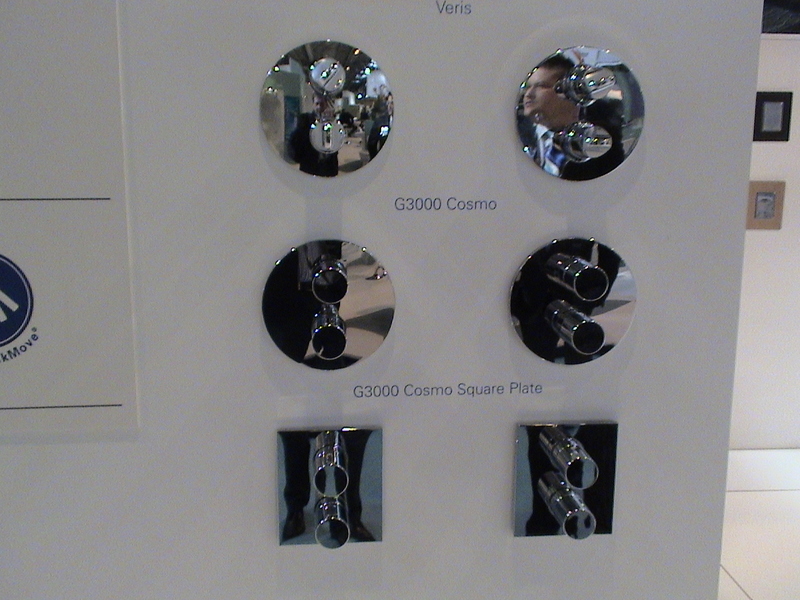 Dazzled by bright lights and shiny chrome brassware I stepped in to the world of Grohe and their new products. I had promised Scott Evans I would join him for a coffee to charge up for a long day. We have known Scott for many years now, with his great sense of humour and gangster pinstripe suit, he is a real friend to many showrooms I am sure! Having his finger on the pulse of the industry simply by knowing most of us in it, when new products arrive Scott will inevitably walk in to Fonte Dei Marmi with a big grin and announce “wait until you see this!” Passionate about design? you will have to ask him. Again, as we are a Grohe Ambassador dealership I am very warmly welcomed to their stand, meeting James Blood, Grohe’s training manager and Mark Doulton, Grohe’s Marketing Director. After a chat and coffee Scott gave me a tour of displays and the run down on Grohe’s newly launched products and design and technical features. The first thing you need to know is that Grohe have introduced new low pressure brassware in an expanded range of deck-mounted bath fillers and bath/ shower mixers – see our photos of them mounted around a Laufen Form bath. These bath fillers work on 0.1 bar and above which is very useful in the U.K as there are occasions when the water pressure is desperately low and the customer will want high quality brassware, most of which requires 1.0 bar at least before it will perform at a reasonable flow rate. 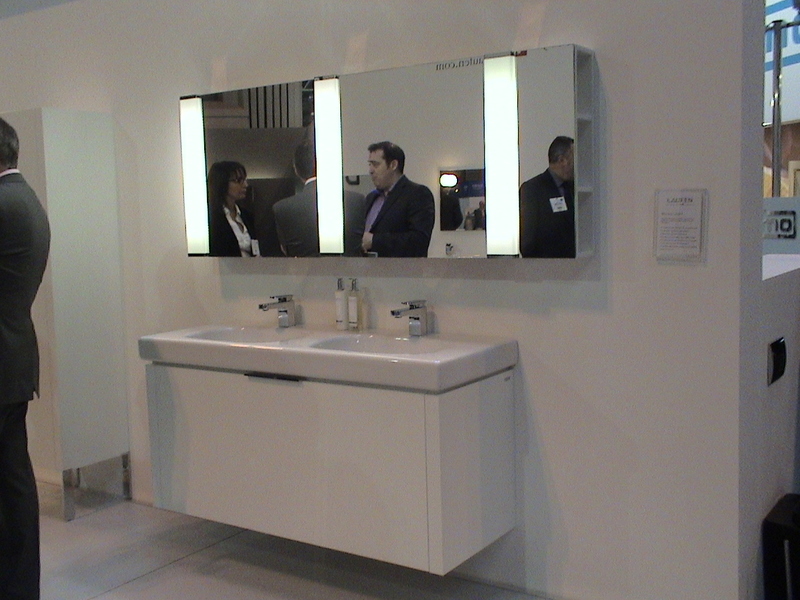 The low pressure deck mounted brassware will be available from June 2010. Grohe have some stunning new wall mounted flushplates for concealed cisterns; using real wood veneer surrounds set in a chrome frame. 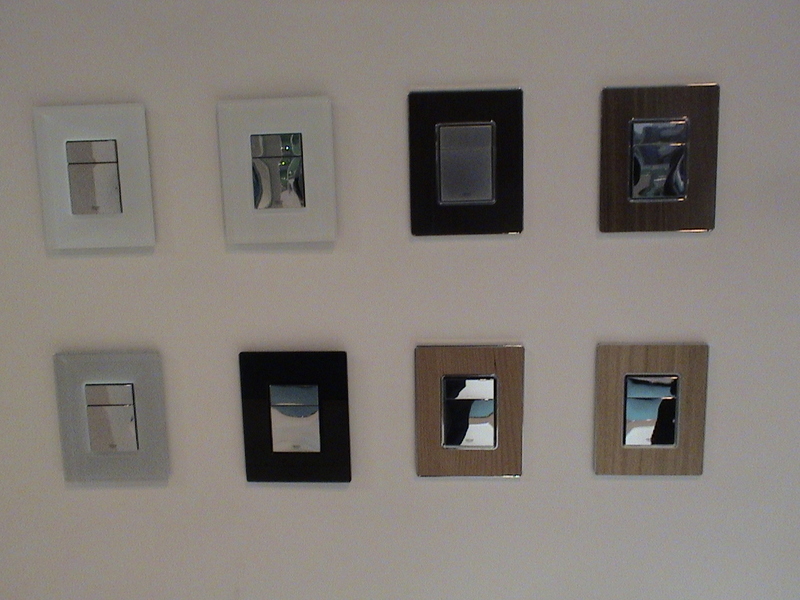 The push button plates come in a range of light and dark wood and also frosted, black and white glass – see photos. While talking about flush plates we should mention the “Nova Light”: a flush button with an orientation light best described as a night light. With either a fixed light colour or colour-changing, this button could be a finishing touch which changes your bathrooms apearence to classy and can add to the” feel good about my home” factor! see photo. 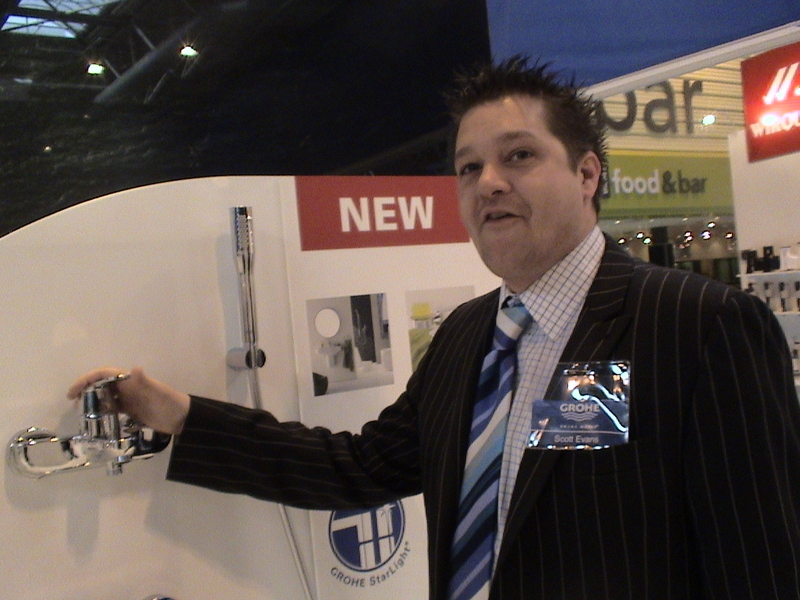 The Grohe “Fresh” system has established itself since being launched recently. 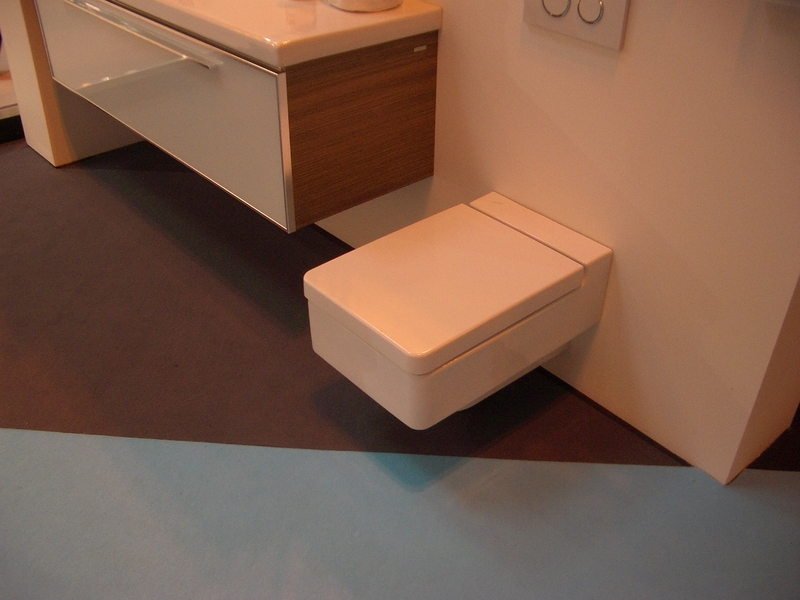 “Fresh” combines a cistern and a rapid SL concealed wall frame with a disinfectant delivery system designed to keep the WC pan hygenically clean and fragrant as a great alternative to the blue disinfectant tablets or pan fitted eyesores. Scott Evans is the face of Grohe on the road, so now he has appeared on the new “Scotty” limited additionNova Light Flushplate in chrome which is out on April 1st! see photo. 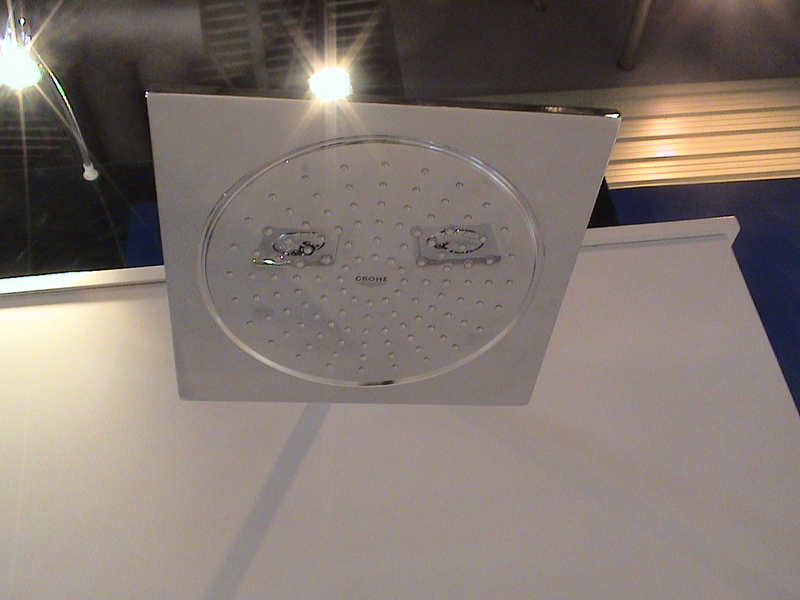 Grohe’s shower range continues to hold its ground with the square “Rainshower Next Generation” which comes in two sizes, the square shape presenting itself as the ideal” ceiling tile style” of overhead shower. The new Grohe “Rainshower” handsets with the doughnut-shaped circular heads are making waves too, arriving in many colours and chrome finishes. Very popular in North London already and I can see why: family homes are buying these to get there youngsters in to the bathroom, being bright colours and fun to adjust with dual spray. Continuing the colour theme, Grohe announced and demonstrated two product products with colour-theme names: the Grohe “Blue” – a filtered water kitchen tap system, and Grohe “Red” – a boiling water solution also for the kitchen. Filtered water taps have been around the industry for a while already and Grohe have come to the party with a very sleak-looking product that is sure to sell well. The more interesting of the two however is the “Red”, on show for the first time ever (so new in fact that it was only the week before the show that the Grohe staff knew for sure that it would be there and working). Available in four and eight litre capacity versions, the Red is a instant boiling water tap that, using an electric element, heats cold water and stores it under pressure so that instant 100 degree water is available the moment the lever (in the case of the demonstration tap) is pulled. Unlike other boiling tap offerings from competing companies, Grohe have been able to engineer a solution whereby the boiling water solution is integrated into a standard kitchen tap design. We are told that the engineers at Grohe are currently working on a tap that combines the normal kitchen tap functions and those of Blue and Red … who knows, it may even have a tea bag dispenser on it too because let’s face it, once you have all of those functions that would be the only bit missing before it could make the tea for you! The Blue is available from April with the Red following on later in the year with an estimated available date of June 2010. 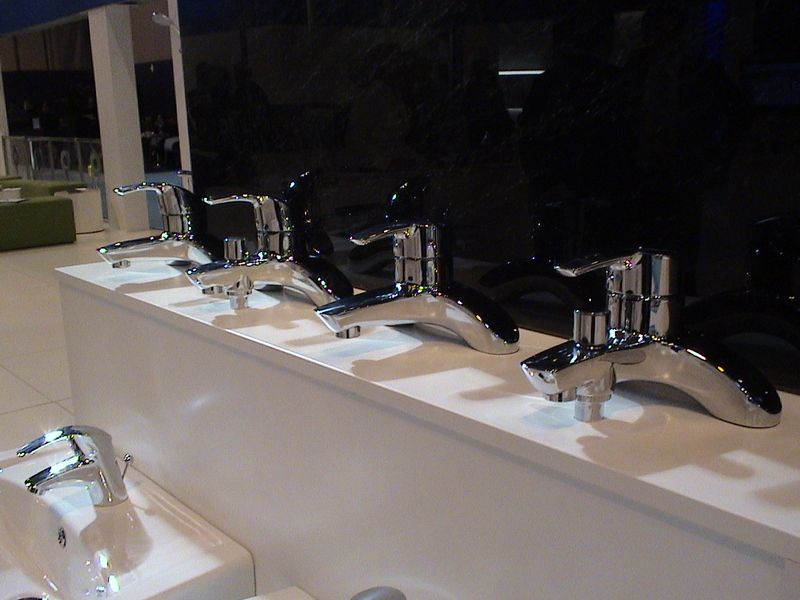 Grohe had a great stand at KBB, and we here at Fonte Dei Marmi were very pleased with our decision to get up to Birmingham and see the products first hand. Birmingham! the massive NEC exhibition centre on a massive industrial estate! Not Birmingham city centre as most people would expect. I arrived at Birmingham International rail station after an impressively fast an efficient journey on one of Richard Branson’s Pendolino units, journey time was one hour and twenty minutes. The tilting train swept up the miles from Euston, giving one an incredible sensation of high speed, so fast it was impossible to read the names of stations as we flew past them. The fare was good value too, only £41.00 return on the day, dismissing all the hype about hundreds of pounds to go “on the day” anywhere north of Watford Gap! A short walk from the station to the entrance of the NEC and then a long walk involving around half a mile involving four sets of escalators, two travellators (giant human conveyor belts) and then a two minute walk to the entrance, at last! we are here. The conversation in the build-up to KBB was mixed; many companies deciding their pockets weren’t deep enough this year, and others dithering on a decision. My first impressions on arriving were that it was slightly less busy, then, meeting familiar faces and finding many people gathered on stands further in from the entrance , my fears were allaid. First stop was at Laufen to see my host for the awards dinner, Andy Jamieson. A fine fellow indeed and someone who can hold a table of ten in awe until the wee small hours! Laufen had made an impressive effort to show off, and rightly so. The products being very smart and the stand very well presented. 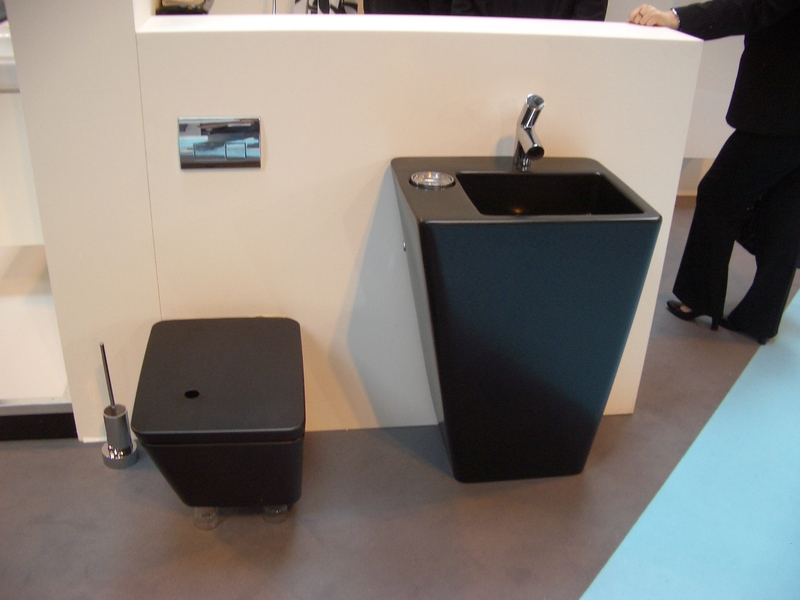 The products chosen were Laufen Mimo, LB3, Moderna plus and Alessi Dot in black. The Laufen Mimo suite with the 1400x800mm bath with a depth of 710mm was far more impressive in real life and is far more solid than a brochure picture would imply. Moderna plus was stunning; the furniture exceptionally well designed and built. I now see how the prices are justified by the quality finish using clearcoat. 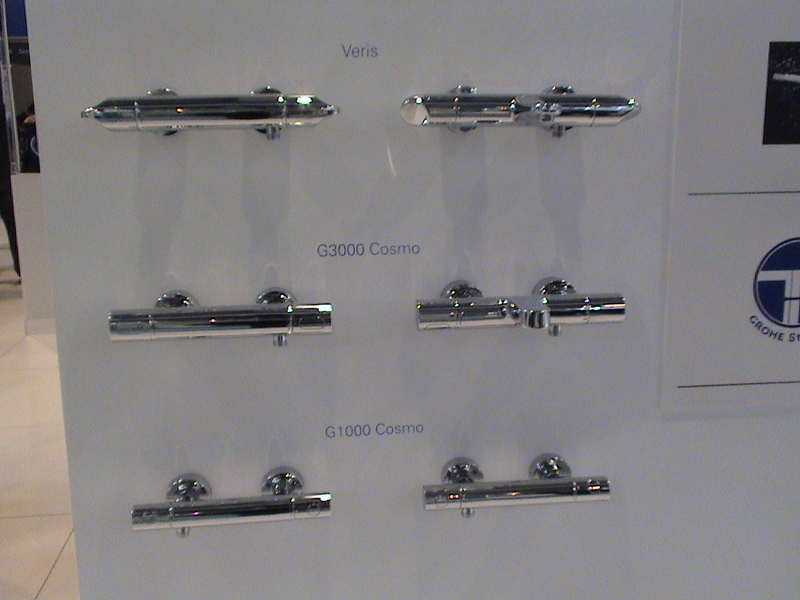 Laufen also used KBB to showcase their new brassware ranges and they did not disappoint either. As an official Laufen Showroom, Fonte Dei Marmi have to think long and hard about what we will recommend and consider placing on display. We have many leading Brassware manufacturers in our portfolio and have to consider this before making room for new and untried products. We can see the quality is there: “Ecostop” being a name for a soft stop feature on the taps, a safety device for children and elderly users, stopping the temperature from rising too high. These are not thermostatic and the handle just moves through this stop to receive hotter water temperature but one can feel the limiter as it turns. Laufen LB3 brassware in appearance is slightly more statesmanlike but keeping in with modern feel of the other products. Bolder and bigger seems to be where we are going here and I think they get away with it. Certainly pleasing on the eye and not complicated either – we will be placing these on display alongside the other established brands at Fonte Dei Marmi. 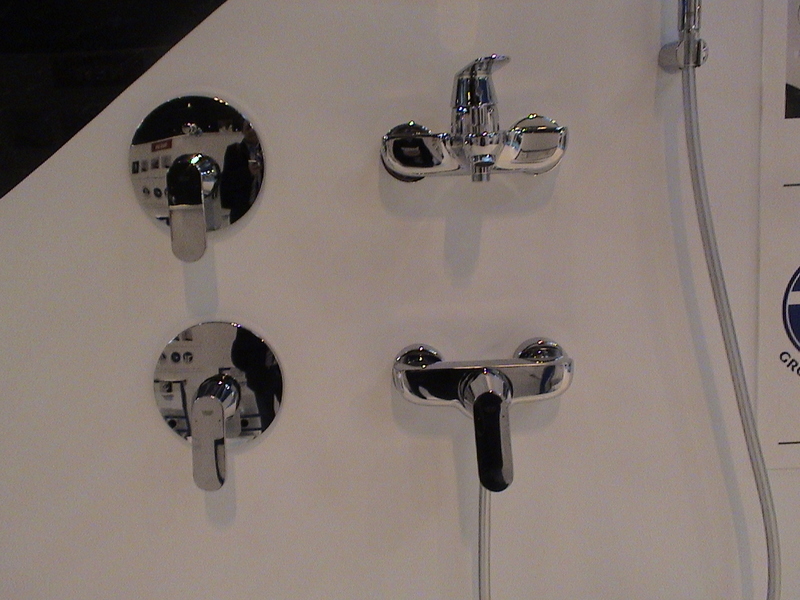 Also on display “Quadriga”, “Twin” and “Fjord” brassware but there is also “Surf” and “Swap” brassware in the new ranges but not at KBB. 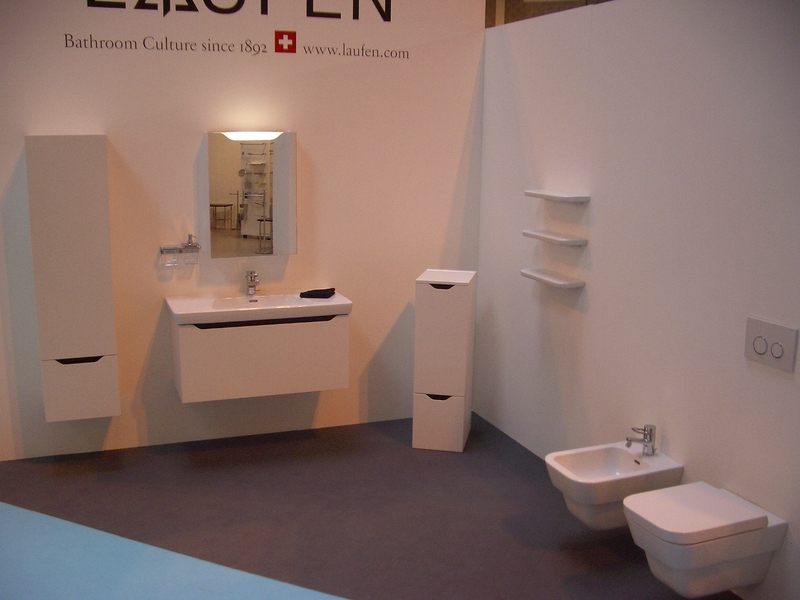 The Laufen LB3 sanitary ware comes in three ranges: “Design”, “Modern” and “Classic”. 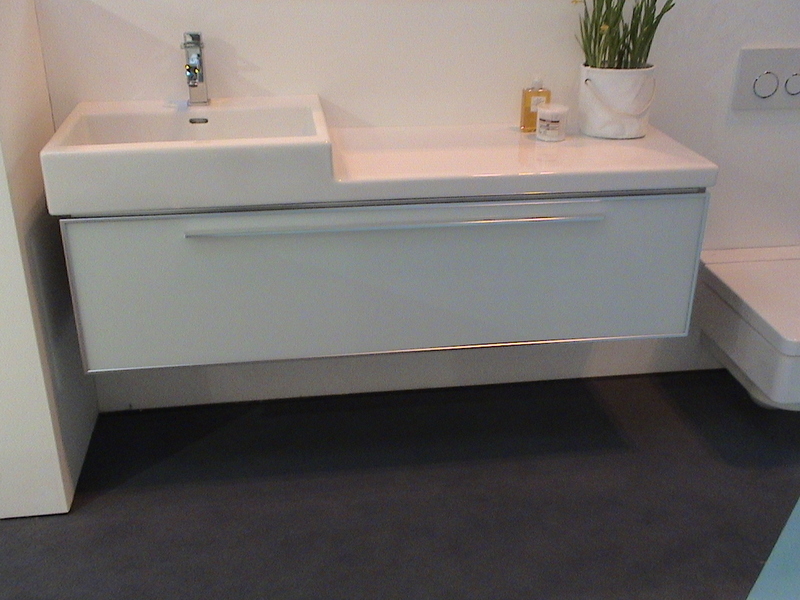 The striking suite as pictured is the Moderna Plus with white finished bathroom furniture. If I had a bathroom at home to do right now I would not hesitate to use this suite. Easy to clean, bright and WOW! all in one! Andy Jamieson was not just a great host with more than one joke to tell but a mind of information when quizzed on Laufen products. We are lucky to have him in our showroom regularly, often hijacked by our customers who then get Laufen products explained to them by the man who makes it, customer service at its finest! 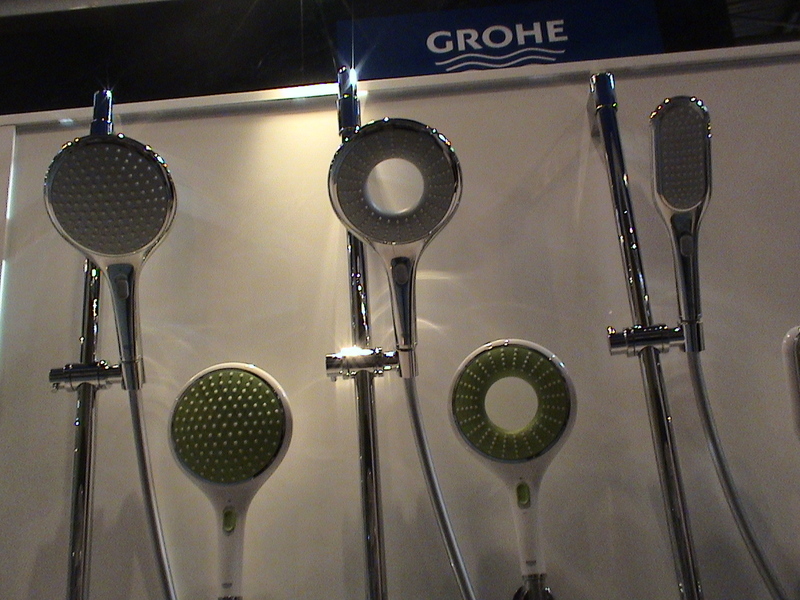 Next stop, Grohe, but that will be in the next blog post. Stay tuned. Manufacturers of all products in all industries continually try to evolve their product range and launch new products to market; that’s been going on since the industrial age and comes as no surprise to anyone. Every once in a while though, a company will launch a new product range which, while very much in-keeping with their existing line up, is new, improved and resonates with the public. That is the case with “Kuadra” by Novellini. As many of you will already know, Novellini has two brands that it manufactures under: Novellini for the standard products, and Elysium for the premium offering. You will likely already know too that Fonte Dei Marmi is the premier London showroom for both of those brands. It is as a result of being in that privileged position that we have been able to witness first hand, the popularity of the new Kuadra product. For a couple of months now, we have had a prototype version of one of the shower enclosures in the showroom, and since it was seen by the very first customer through the door after it was installed, we knew it would be a hit. Well now, the product has been officially launched to the UK market and the first few truckloads of product are, as we write this post, en route from the factory in Italy to the UK ready to be shipped out to the first set of customers. 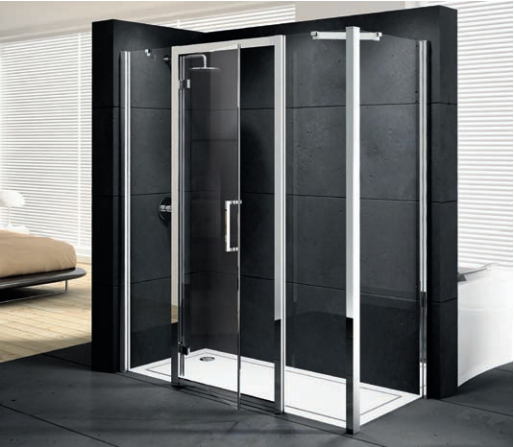 As one would expect from Novellini, the Kuadra range is complete – from wet floor panels and enclosure side panels to pivot doors, sliding doors, double sliding doors and pivot doors with inline panels and bath screens. The only notable omission from the range is a quadrant corner enclosure, but the reasons for that are completely obvious when you see the product. Sporting an anti-bacterial solid-looking (and feeling) chrome profile and 8mm tempered safety glass, Kuadra has the feeling of a very well made product right from the get-go. Clear glass is the norm throughout the range with some models available in “Ravenna” print for both design and modesty. With Ravenna print specified, it is applied directly to the glass at the factory and sports an attractive and very modern chequered square pattern on the glass. The innovation of the range are the new UV bonded hinges – unique to the Novellini group – which are a design innovation giving the hinges the excellent strength qualities of UV bonding to the glass without having to drill trough the glass or have hinge mechanisms on both sides of the door. See the images below for a taste of how the new UV bonded hinges enhance the product offering. Kuadra is the first range under the Novellini brand to be made in 8mm glass (it has been available in the premium Elysium range from the beginning) and the EasyClean finish comes as standard on all products in the range for easy cleaning and maintenance. 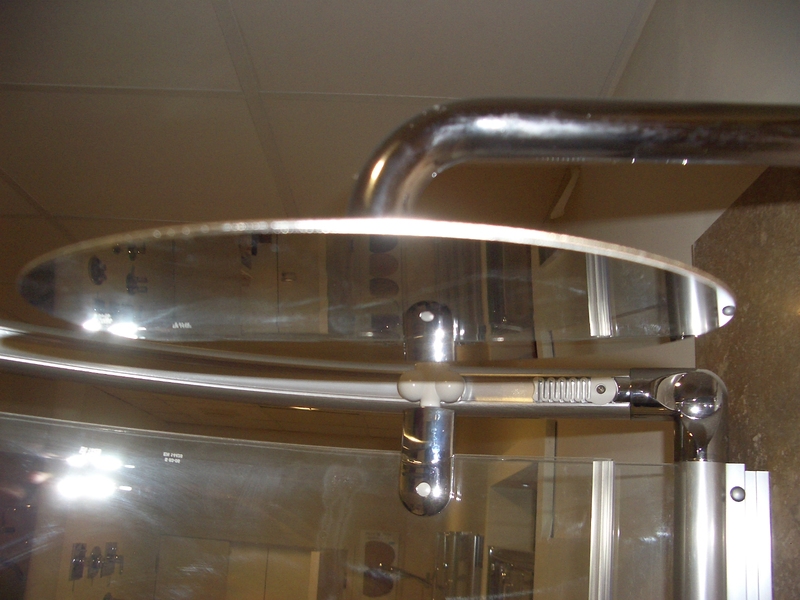 Present too on all applicable products in the range is a metal handle and panel adjustments of up to 60mm. New to the Kuadra range is that all glass is now 2.00m high (rather than the previous 1.95m in the Novellini range). Speaking to Chris Hewitt of Novellini about the Kuadra and what it means to him, and to Novellini, he said “I am really excited about the new product and I took an order for a £10,000 contract before it was even launched, and I know it will be a very well selling product.” He is a man of few words when it comes to a sound bite, but it does sum the product up perfectly, and correlates directly with our own feelings about how popular this product is certain to be. With a price point beneath that of the premium Elysium range, but at the upper end of the Novellini range, it is perfectly priced for the quality and style which is sure to please everyone given the recent financial hardship that the country has suffered. Fonte Dei Marmi will of course have a large chunk of the first batch of products off the truck in the next few days down to the showroom as display models on public display. In the meantime, we do already have a couple of the products in the range to show and we welcome all visitors to discuss them with us. Brochures on the Kuadra product will be available shortly after launch and Fonte Dei Marmi will have stocks of them hot off the presses. 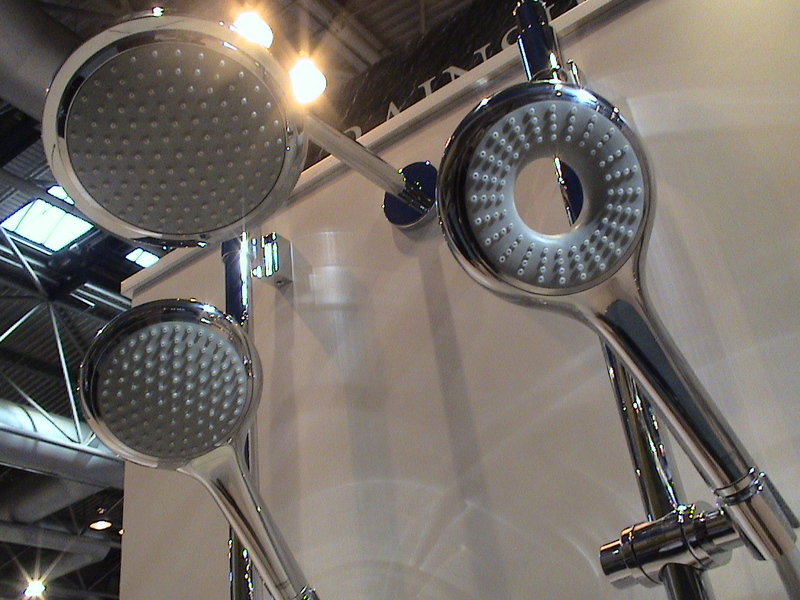 Introducing the world’s thinnest shower head. At 2mm thin in stainless steel, this 225mm diameter Italian designed and manufactured shower head takes style to a whole new level. 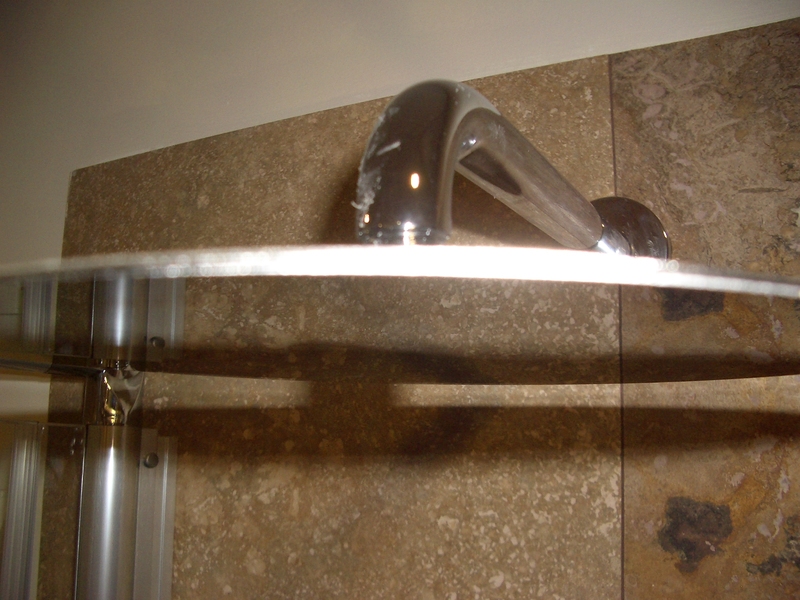 This is a fixed shower head that attaches to a standard wall or ceiling arm, and produces an X-shaped spray pattern with excellent flow rate. Recommended pressure of 2.0 bar or above for the best effect, this shower head is a must for any stylish bathroom re-model. Given the thinness of the product, it is entirely possible to have it mounded directly to the ceiling without the need to undertake extensive modifications to the existing ceiling … just flush mount it and the effect is the same.